Dentek Floss Picks Only $.99 At Walgreens! Walgreens has Dentek Floss Picks on sale 2/$5, plus they are buy one get one! Combine sale with coupon and everyday points to score 75 - 90 ct packs for $.99 each through 12/31! Her's how:Buy 2 Dentek Floss Picks 75-90 ct B1G1 2/$5 Use $.50 DenTek Floss Picks coupon Pay $2, Get 20 Everyday … [Read more...] about Dentek Floss Picks Only $.99 At Walgreens! 7Up Or Canada Dry 2-Liter Only $.49 At Walgreens! Walgreens has 7Up and Canada Dry 2-liters on sale for $1 right now! Combine sale with Everyday Points and Ibotta Rebate to score a bottle for $.49 each through 12/17! Here's how:Buy 7Up or Canada Dry 2 liter $1 Pay $1, Get 10 Everyday Points and $.50 from Ibotta Final Price: $.49You have … [Read more...] about 7Up Or Canada Dry 2-Liter Only $.49 At Walgreens! U By Kotex Ultra Thin Pads Only $.71 At Walgreens! Walgreens has select Kotex items on sale buy one get one 50% off right now! Combine sale with Walgreens coupon, insert coupon, Everyday Points, and Ibotta Rebate to score U by Kotex Ultra Thin Security Pads for $.71 per pack through 12/17! Here's how:Buy 2 U by Kotex Ultra Thin Security Pads … [Read more...] about U By Kotex Ultra Thin Pads Only $.71 At Walgreens! 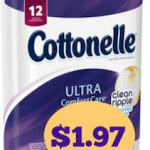 Cottonelle 12-Count Bath Tissue Only $1.97 At Walgreens! Starting 12/18, Walgreens will have Cottonelle Bath Tissue on sale for $3.99! Combine sale with Walgreens coupon, printable, and Everyday Points to score 12-packs for $1.97 each next week! Here's how:Buy Cottonelle Bath Tissue 12 ct $3.99 Use $1 Cottonelle Walgreens coupon from December Coupon … [Read more...] about Cottonelle 12-Count Bath Tissue Only $1.97 At Walgreens! Graze Snacks Only $.48 At Walgreens! Walgreens has Graze Snacks on sale for $1.49 right now! Combine sale with Checkout 51 offer and Everyday Points to get boxes for $.48 each through 12/14! 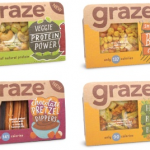 Here's how:Buy Graze Snacks 33-38 g $1.49 Pay $1.49, Get 10 Everyday Points and $1 from Checkout 51 (Choose from Apple Pie, Cherry Tart, … [Read more...] about Graze Snacks Only $.48 At Walgreens!